While it seems too simple to be true, infused water can actually provide you with as many nutrients as tea. Throughout history, ginger has been widely used to relieve nausea. It’s commonly used to prevent seasickness. It has been used as a treatment for nausea and vomiting associated with a variety of conditions, including chemotherapy and pregnancy. Drinking ginger water may be anti-inflammatory, and prevent joint swelling and pain experienced in conditions such as osteoarthritis and rheumatism. An article published in “Journal of Medicinal Food” in the 2005 summer issue noted that during the past 25 years scientists have provided scientific support for the long-held belief that ginger contains powerful anti-inflammatory properties. Ginger is also source of antioxidants. Antioxidants are powerful substances that protect your body against free radicals, which are unstable molecules that may cause damage to healthy cells. Ginger water may be effective in helping to prevent and inhibit cancer growth. The mechanisms responsible are substances in ginger, including antioxidants, which have been shown to kill and decrease the spread of cancer-causing substances in the body. 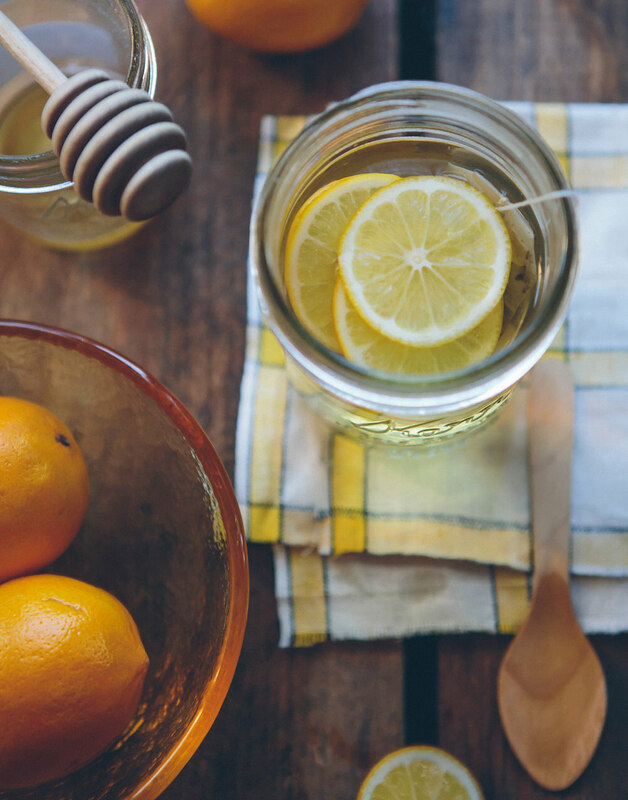 Vitamin C is an energy booster, and lemon juice is full of it. The level of vitamin C in your system is one of the first things to plummet when you’re stressed, which is why experts recommended popping extra vitamin C during especially stressful days. Lemons are also high in potassium, which is good for heart health, as well as brain and nerve function. Lemon juice not only encourages healthy digestion by loosening toxins in your digestive tract, it helps to relieve symptoms of indigestion such as heartburn, burping, and bloating. Lemon water will also help to cleanse your system, flushing out the toxins in your body by enhancing enzyme function, stimulating your liver. The antioxidants in lemon juice help to not only decrease blemishes, but wrinkles too. It can also be applied to scars and age spots to reduce their appearance. The pectin fibre found in lemons will also aid in weight loss. Lemons will decrease the acidity in your body. It removes uric acid in your joints, which is one of the main causes of inflammation. Combo: Combine ginger and lemons in water to receive the health benefits of both! Strawberries have great diuretic, purifying, and antioxidant powers. They are rich in vitamins A, C, and E, iron, vitamin K, and folic acid. Strawberries have anti-inflammatory properties, which is why they help you when you have muscular properties or any bone diseases. Strawberries have soluble fibre, which means they are a huge help in the absorption of carbohydrates and help keep sugar levels balanced. They are also good at fighting constipation. It keeps you hydrated. Your body can’t function properly without water. The American Academy of Physicians says that aiming for six to eight glasses of water a day is a good goal for most people. We know we’re supposed to drink water throughout the day, but sometimes plain water gets boring. Adding cucumber gives it some extra flavour, encouraging you to drink more. If you’re trying to lose weight, replacing sugary sodas, sports drinks, and juices with cucumber water can help you cut some serious calories from your diet. Staying hydrated also helps you feel full. Cucumber is rich in antioxidants too. Some early research suggests that cucumbers may help in the fight against cancer. Along with antioxidants, cucumbers also have compounds called cucurbitacins and a group of nutrients called lignans, which may have a role in protecting us from cancer. One study in the Journal of Cancer Research suggested that the dietary flavonoid fisetin, which is found in cucumbers, might help to slow the progression of prostate cancer. Potassium is an electrolyte that helps regulate the amount of sodium retained by the kidneys. Cucumbers are a good source of potassium. Drinking cucumber water helps your body get more potassium, potentially helping to lower your blood pressure. Cucumbers are also high in vitamin K. In fact, one cup of sliced cucumbers has about 19 percent of the recommended daily value. Your body needs vitamin K to help form proteins that are needed to make healthy bones and tissues as well as to help your blood clot properly. Pineapple is highly regarded for its ability to fight inflammation, thanks to the enzyme bromelain. Another great reason to drink pineapple water on a daily basis is because of its ability to help with weight loss. Pineapple is high in fibre, which means that it takes a longer time for your digestive system to break it down. As a result, you’ll feel fuller longer when you drink pineapple water. When you drink it on an empty stomach, you’ll experience less cravings for sugars and fats.